Fierce Fridays at GETFIERCE TRAINING are all about answering your questions. This weeks is quick and dirty…What’s the best gym bag? Ya’ll wanna know and I have the best! Over the years I’ve gone through LOTS of bags, backpacks, you name it I’ve carried it (except those bags on wheels, those aren’t for me). I love this bag! It’s super light and holds a ton. It has a ridiculous amount of pockets and is water resistant. 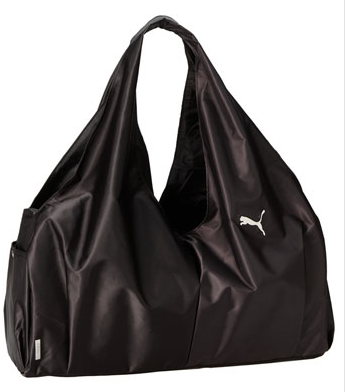 For me it’s THE perfect gym bag. I have no connection to Puma, this is a solely a consumer report I give it a 10 outta 10. If you’re in the market for a new bag this is a FIERCE one! This entry was posted in FIERCE FUN, FIERCE- ISH and tagged bag, fitness, workout by GETFIERCE TRAINING. Bookmark the permalink. I do need a new gym bag! I’ve been saying that for about a month. Thanks for sharing.